Use just ripe or very slightly under-ripe melon for this recipe so that the flesh is still firm. 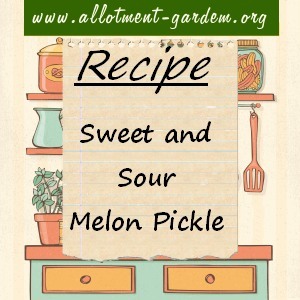 Cut the melon into quarters and discard the seeds and skin. Cut into strips and put in a colander. Sprinkle with the salt and leave to stand for 2 hours. Pour boiling water over the melon to remove all the salt. Place the spices on a small square of muslin and tie firmly. Put the melon in a pan with the vinegar and muslin bag. Bring slowly to the the boil and simmer for 5 minutes. 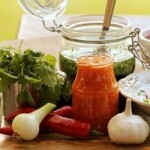 Use a slotted spoon to remove the melon and pack into hot sterilised jars. Bring the liquid back to the boil and remove the muslin bag. Pour over the melon and seal. 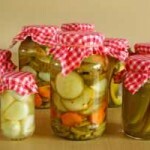 Makes about 3 lbs (1.4 kg) of Sweet and Sour Melon Pickle. Delicious served with sea food, especially prawns or shrimps served in their shells. Also goes well with salads. 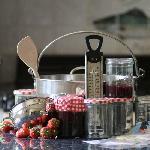 All the equipment you need to easily make your own jams, chutneys and preserves. 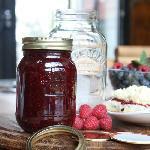 Say goodbye to mass-produced supermarket jams and preserves and start producing your own unique accompaniments to meals using your own produce.